The R&S CMW270 wireless connectivity tester with the new test software for Bluetooth® 5.1. With the new Bluetooth® core specification version 5.1 (BT 5.1), Bluetooth® Low Energy (BLE) devices can optionally offer improved navigation services. Additional functionality for direction finding (angle estimation) using the angle of arrival (AoA) and angle of departure (AoD) methods enables position determination with accuracy down to centimeter level in both the transmit and receive direction. Previous solutions could only provide meter level accuracy. Devices with BLE 5.1 functionality are suitable for tasks such as indoor asset tracking and for navigation services at airports. Beacons are already being used to call attention to specific nearby products, sights and attractions in public spaces. BLE 5.1 now makes it possible to guide interested parties precisely to these points of interest. The Bluetooth® Special Interest Group (SIG) expects that by 2022 around 400 million additional devices will use the Bluetooth® 5.1 location services solutions. 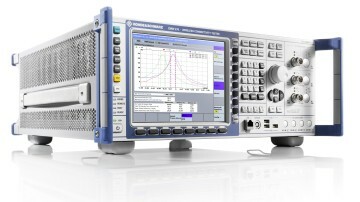 To enable device manufacturers to test their products in line with Bluetooth® 5.1, Rohde & Schwarz has expanded its BLE test solution to include 23 new test cases in direct test mode (DTM) defined in the new RF-PHY.TS.5.1.0 test specification. With these tests, manufacturers can demonstrate that their products are RF interoperable with other devices and that direction finding meets the requirements of the BT 5.1 specification. The R&S CMW test platform delivers the full range of Bluetooth® RF tests, including Bluetooth® Classic, Bluetooth® LE and Bluetooth® 5.1. In addition to DTM and signaling tests, it supports a wide scope of audio tests on Bluetooth® basic rate/enhanced data rate (BR/EDR) links. The R&S CMW test platform is especially suitable for tests in the development phase, for preconformance tests, for qualified audio tests, and for use in Bluetooth® OTA test systems. The R&S CMW test platform employs a parametric test concept that enables users to create application-specific test sequences. The test platform bandwidth has been extended to 160 MHz. This also allows WLAN RF signaling tests in line with the IEEE 802.11a/b/g/n/ac standards, including IEEE 802.11ax. RF tests compliant with IEEE 802.15.4 for Zigbee and Thread components are also supported.